For example, did you know that depression has now been traced back to long-standing low-grade inflammation? And as we’re seeing over and over again, inflammation usually begins in the gut. Let’s break it down. Studies have been showing the dramatic effect of the microbiome on the nervous system, with dysbiosis being associated with conditions like anxiety, depression and even autism. With autism, for example, it has been observed that depending on how severe the condition is, specific differences in the gut flora can be seen. Also, Irritable Bowel Syndrome (IBS) is being studied as another possible condition associated with the imbalance of the GBA, especially in the brain-to-gut communication direction. What this means is that people were right when they felt that IBS is a condition that arises from stress, as evidence is beginning to show. What it also means is that generally, gut flora has a profound effect on your mood and mental clarity. This brings us to the very important topic of dysbiosis. Dysbiosis is when the microbiome is out of balance, and that is a key contributor to all of these types of dysfunctions. But what causes dysbiosis in the first place? Your gut contains two-thirds of your immune system cells and it produces inflammatory cytokines whose function is to help cells communicate during an immune response. The cytokines produced by the microbiome also send signals to the brain to secrete the neurochemicals that support the inflammation response. A healthy microbiome will elicit a balanced immune response with just enough inflammation to do the job that then subsides when it’s no longer needed. But if you suffer from dysbiosis, this starts to wear down your gut lining, which can then become leaky. 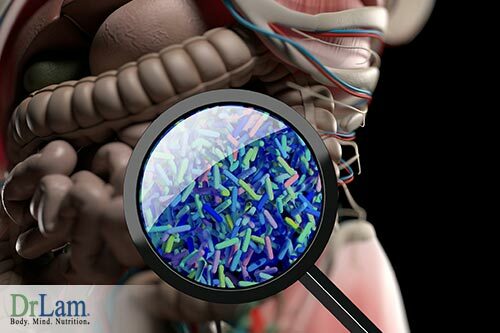 When you have a leaky gut, particles such as food, toxins, and pathogens can get into your bloodstream. Then the immune system sees these invaders and mounts an attack, causing inflammation. But because you eat like this every day, three times a day, your immune system is constantly switched on and you begin to suffer from chronic inflammation. The inflammatory cytokines produced by the gut travel to other parts of the body, creating oxidative stress. 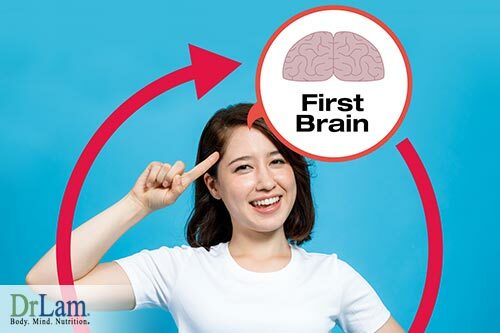 In the brain, they divert the process of tryptophan converting to serotonin and melatonin to instead converting to anxiety-inducing chemicals. This has a huge effect on sleep, libido, clarity of mind, ability to socialize, appetite and energy levels. It’s been shown that people with high levels of CRP or other inflammatory markers don’t respond as well to antidepressants. They first need to have the inflammation treated in order to improve their mood, and they may end up not needing antidepressants at all, or they may begin to respond better to them. Another important link that has a lot to do with psychological well being and the gut is the body’s stress response. That’s because stress has a direct effect on the microbiome, as well as the delicate balance of mood hormones. When you are chronically stressed, your body’s capacity to deal with it begins to weaken. The first line of defense, the HPA, which is part of the hormone circuit of the NEM, can be disturbed. The adrenal glands that produce the body’s main anti-stress hormone, cortisol, are overworked and are unable to meet the growing demand for more. Also, the inflammation that is at the root of the GBA imbalance is actually a dysregulated NEM inflammation response. This inflammation response has been affected by the deficiency in cortisol production because one of cortisol’s jobs is to suppress the immune system and neutralize inflammation. The rest of the NEM’s six circuits are affected as well. The metabolism response is next in line after the hormone response as they are intricately linked. And with a dysregulated metabolism, you can experience thyroid issues, fatigue, and a lowered ability to fight oxidative stress. A slowed metabolism will make it more difficult to recover from emotional trauma, will make the NEM’s detoxification response sluggish, and will clog up the extracellular matrix. With a suboptimal detoxification response, toxins and metabolic byproducts begin to accumulate in the system, causing more inflammation as well as an increase in the toxicity in the body and brain. This may sound like a downward spiral, and in many ways it is. But don’t let it discourage you because there is good news: the road to healing adrenal fatigue, NEM dysregulation, dysbiosis, inflammation, and the psychological stress and mood disorders that stem from these issues is the same. And that’s thanks in part to the GBA, as well as the central role the gut plays in all of the above. That road is through food. New research is coming out that shows that increasing the amount of fruit and vegetables in your diet can enhance your psychological well being in just a few weeks. And of course, that brings with it other health benefits such as a stronger immune system, a healthier gut, more energy, better digestion, and all the nutrients and antioxidants that improve vitality and fight off disease. A two-week study conducted by Dr. Tamlin Conner of the University of Otago’s psychology department and his team divided 171 students between ages 18 and 25 into three groups. The first group was left to continue with their regular diets, the next group was given vouchers for fresh produce and received reminders to eat more fruits and vegetables, and the last group was directly given two extra servings of fruits and vegetables to eat per day. These students were assessed for mood, motivation, energy and psychological well being before the study began. The results showed that the group that was given the additional servings had the highest improvement in things like vitality and motivation, while the other two groups did not experience any changes. But it is important to note, however, that none of the groups showed improvement in anxiety or depression symptoms, and that could be due to the brevity of the study. Thankfully, this topic is now becoming one of great interest to medical science and public health, especially with the alarming rise in mental health issues worldwide, and the effects that this has on the economy. But here’s where we will need to get a little more nuanced. 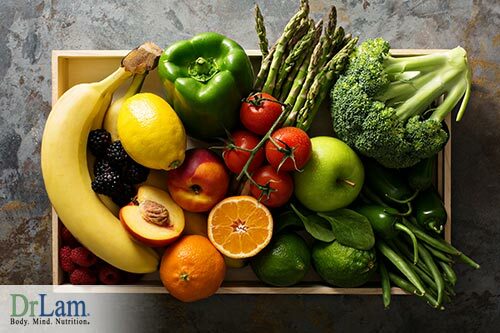 Although increasing your fruit and vegetable intake is highly recommended in most cases, the kinds of fruits and vegetables you eat, their total sugar content, and the way you cook them (if cooked at all) are all factors that can influence any existing conditions. Is The Adrenal Fatigue Diet A Good Bet? If you have adrenal fatigue, chronic stress, dysbiosis, or a dysregulated NEM stress response, then the adrenal fatigue diet is the safest option for you. In fact, depending on how advanced your AFS is, you might need to be careful even with which parts of the adrenal fatigue diet you should follow and which parts you should only implement after your adrenals have regained some strength. For example, a severely debilitated state may not be strong enough to handle a lot of fresh fruits and vegetables, and cooked food that is easily digestible may be the better option at first. This is why it is highly recommended that you do not use a one-size-fits-all method with diet. You will need to get a personalized strategy from an experienced professional who deals with adrenal fatigue so that you can avoid any pitfalls and make the best strides towards health you can. Slowly and gently should be your motto. The other thing to be aware of is the use of supplements. 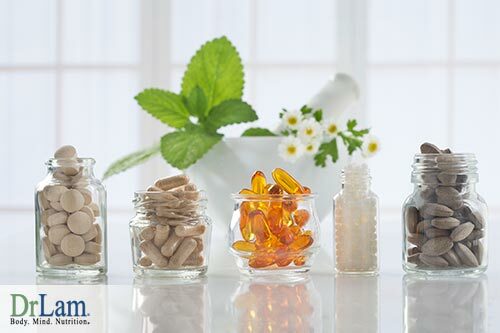 While supplements can greatly enhance psychological well being, especially if you are deficient in important vitamins, hormones, or nutrients – such as vitamin D or omega-3 fatty acids or B12 – you should never take the shotgun approach and take a bunch of supplements hoping that one of them will work. Some might cause harmful reactions, some might slow down your recovery, and some might be very helpful. Again, the advice of a professional can make all the difference. Also, the good thing about the adrenal fatigue diet is that it is basically an anti-inflammatory diet, which is exactly what you need for a healthy GBA. It decreases some of the usual suspects in the domain of food sensitivities, such as gluten and dairy, while adding in some of the really good guys, such as antioxidant-rich and low-sugar fruits. And that’s another thing it’s very good for blood sugar balance. Because those with AFS can experience insulin resistance as well as hypoglycemia, both of which can affect mental faculty. Overall, more fruits and vegetables will improve your psychological well being, but it’s always good to do your research and seek the right strategy first before diving in head first.